Home / Headlines / Is Virgil Van Dijk Set to Remain at Southampton? One of the longest transfer sagas of the summer continues to rumble on. Virgil Van Dijk has been heavily linked with a move away from St Mary’s having been linked with clubs such as Arsenal and Liverpool but the big defender who is valued at around £60 million might end up staying on the south coast. The Dutchman was believed to be keen on a move to Merseyside and even handed in a transfer request claiming he was ‘insulted’ by the club. The 26-year-old had expressed his desire to leave the Premier League club and is rumoured to have made his stance clear to the Southampton hierarchy however as of the middle of August, he still remains a saints player. It’s been a summer of change at the club with manager Claude Puel departing and being replaced by former Alaves coach Mauricio Pellegrino. Puel failed to inspire during his one season at the club and his brand of football was described as ‘boring’ and ‘predictable’ by a number of fans. The Saints failed to win any of their last five home matches whilst also drawing blanks in each of those contests under the Frenchman who eventually paid the price for his ultra-conservative approach. The club have won just twice at St Mary’s since the beginning of the calendar year with many of the supporters visibly frustrated and very few of them shed a tear when Puel was given his marching orders at the end of the campaign. Van Dijk will now be working under the progressive Pellegrino who guided unfashionable Alaves to a mid-table finish in La Liga and a Copa Del Rey final where they were narrowly beaten by Barcelona. New club captain Steven Davis has told the media that the new boss is a ‘breath of fresh air’ and that all the players have enjoyed working with him and training with a smile on their faces. Despite the positivity, Southampton still failed to score against Swansea on the opening weekend of the new Premier League season. Van Dijk didn’t feature in that match amid the intense speculation surrounding his future with Yoshida and Jack Stephens combining to keep a clean sheet. Despite dominating the game, the Hampshire club were left frustrated in front of goal once again but Pellegrino insisted afterwards that ‘the goals will come’. Despite a poor end to the campaign, Southampton still finished 8th in the final Premier League table albeit 15 points shy of Everton in 7th position and with a disappointing goal difference of -7. Van Dijk’s insistence that he requires ‘a new challenge’ hasn’t gone down well with supporters many of whom believe the club should cash in on their star asset. Southampton have apparently lodged a bid for Lazio defender Wesley Hoedt this week as they look to the future without Virgil Van Dijk. The Dutch centre-half is likely to command a fee in the region of £16 million but comes off the back of a superb season in Serie A with Lazio. Simone Inzaghi’s side reached the Coppa Italia final and snuck into the European places last year with Hoedt a huge part of their success. The 23 year old has already been linked to both Everton and Leicester City this summer and is believed to be keen on a move to the Premier League. The club have also added Juventus’ Mario Lemina to their squad this week in a deal reported to be worth £18 million. The Gabon International signs a five-year deal on the south coast and becomes the club’s second addition of the summer. The midfielder has also been linked with fellow Premier League outfit Watford and becomes the clubs record signing. Van Dijk has also been linked with Chelsea and Manchester City throughout this transfer window although Liverpool is believed to be his favoured destination. Jurgen Klopp’s side were once again left defensively exposed as they conceded three times to Watford on the opening Saturday of the season with Reds fans urging their side to sign reinforcements for the season ahead. Southampton have a couple of home matches before embarking on their first away trip of the season making the long journey to West Yorkshire to take on Premier League new-boys Huddersfield Town and Pellegrino will be hoping to have a new defender in place before they visit the John Smith’s Stadium. The Saints lack of firepower has meant many punters have been regularly backing Under 2.5 Goals and both Half Time Draw and a 0-0 Final Score were correctly selected by the Oddschecker tipsters in their preview of the Saints recent encounter with Swansea. 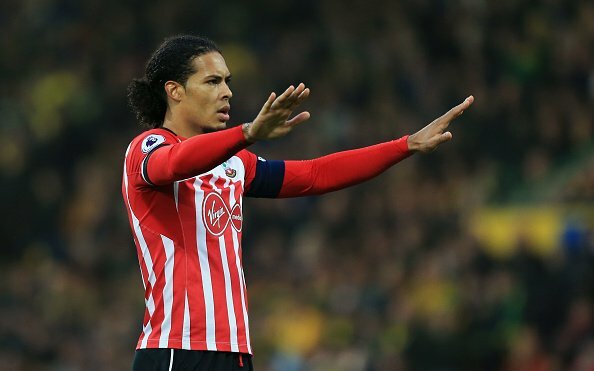 In the latest twist to the long-running transfer saga, Southampton chairman Ralph Kreuger has insisted that Van Dijk is not for sale in this transfer window. The unsettled centre-half is unlikely to be pleased by the statement but his path away from the club looks like it may be blocked. The club have also asked the FA to investigate an illegal approach from Liverpool alleged to have taken place in June. This could delay any possibility of a completed transfer until the January window. Chinese businessman Jisheng Gao has reportedly purchased a stake in the Premier League outfit this week and is believed to have paid in the region of £210 million for his share. Following the completion of the deal, the club issued a statement declaring “Today is the start of a new and exciting chapter for our club”. Kreuger defiantly suggested that keeping hold of the wantaway defender is a statement of intent and will help the Saints shed their unwanted tag of a ‘selling club’ following wholesale departures for the last couple of summers. Morgan Schneiderlin, Adam Lallana and Ryan Bertrand have all made big money moves away from the club in recent transfer windows leaving a huge re-building for the side on each occasion. The chairman went on to praise his manager for the way he has dealt with the issue in the press. In an interview for the club’s website this week, Van Dijk’s teammate Nathan Redmond has called upon the defender to commit to the club for another season as Southampton aim to break into the top six of the Premier League. He also added that the pair have agreed not to mention any transfer speculation whilst training together. The Dutchman has reportedly been knuckling down and maintaining his fitness despite the lack of game time at the club and is believed to have been training as normal with the rest of the squad although he was not invited to attend the club’s recent pre-season tours of both Austria and Switzerland. So where does all of this leave Van Dijk? The former Celtic defender may wish to play his football elsewhere but patience may be required. It is believed his agent helped arrange meetings with potential suitors despite the clubs disapproval and the Dutchman must be careful not to burn any bridges with his current employer. He will want to avoid finding himself in limbo once the transfer window has slammed shut. He has not been exiled by Pellegrino yet which suggests that the Argentinean boss would welcome him back into the fold should he fail to secure a move away from the club. Van Dijk has until the end of August to decide where his future lies. The club are hoping that any move fails to materialise and they will do everything within their power to keep hold of the talented centre-half. Liverpool are still the favourites to secure the signature of the 26 year old according to the betting markets as their need for a new defender intensifies. It’s been a strange few months for the Dutchman who will surely just be desperate for his future to be decided one way or another.